More than any other, that is the question I get most asked about. Anything happening with the Dynamo House? I tell people I know it is firmly planted on the Planning Department’s agenda, the Mayor seems to be concerned about it, but the economy blows. Well, Providence Business News had a little more info yesterday. Harbor East Development Group LLC is looking to take control of the project from the beleaguered Struever Bros. Eccles & Rouse. Like Struever, Harbor East is Baltimore based; they were originally an investor in the Dynamo House project. The $150 million project has been beset by numerous setbacks, with the latest being the financial implosion of Stuever Bros. We’ve written about Struever’s financial woes before. 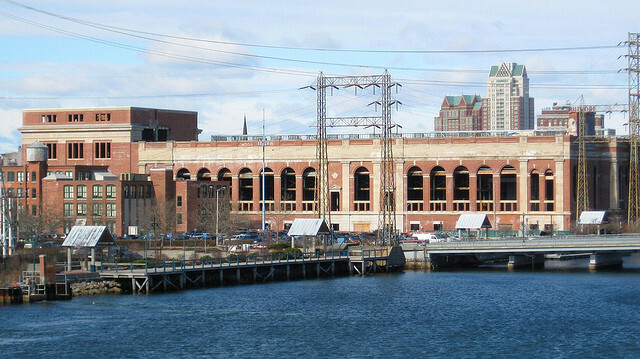 The power plant was originally donated to the Heritage Harbor Museum by Narragansset Electric in 1999 and the entire building was to be devoted to the museum. As it became clear that Heritage Harbor could not fund a museum of that size, private investors were brought in to work with them. Eventually settling on a plan that included approximately 150,000 square feet of office space and an Aloft brand hotel. Currently there is various grant money, state bonds, and historic tax credit money sitting in limbo to go towards funding the project. There are also a gaggle of creditors looking for money for work that has already been done, but was not paid for; putting anyone who takes over the project in a tough position. The other tough position is making up the rest of the financing. Providence’s office vacancy currently sits at around 21% and the credit markets are what one could call, tight. Having a big tenant lined up could persuade lenders to open the credit spigots. “We have to [find] a 150,000-square-foot user, or you’re not going to build anything,” [Michael Ricketts, Harbor East’s vice president of development] said. So we currently stand with a new developer in the process of taking over ownership of the property and control of the project. Funds floating around waiting for the project’s future to become clear (though not close to the estimated $150 million needed). A badly bruised Heritage Harbor Museum still looking to make it work. A franchise agreement for an Aloft Hotel on site. And 150,000 square feet of office space needing a tenant. If anyone knows anyone who is looking for a 150,000 square feet of office space in Providence, have them call Harbor East. Seriously, the perfect spot for Providence Roller Derby.